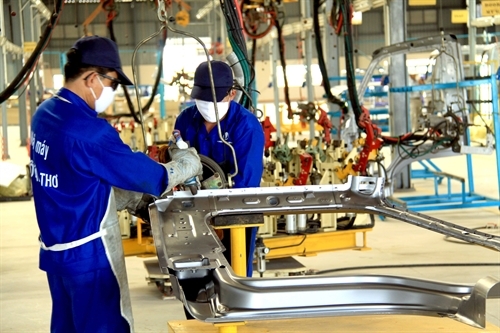 Cần Thơ last month issued a licence to South Korea's Tae Kwang Vina Industrial for setting up a shoe production plant in its 2B Hưng Phú Industrial Park. HCM CITY (VNS) - Cần Thơ last month issued a licence to South Korea's Tae Kwang Vina Industrial for setting up a shoe production plant in its 2B Hưng Phú Industrial Park. At over US$ 171 million, it is the Mekong Delta city's biggest ever foreign project, the chairman of its People's Committee, Võ Thành Thống, said. Many investors from Japan, South Korea and other countries have come to explore the city's investment environment and many have sought to invest, he said. "The city will issue licences for some new FDI projects in the coming time." The city would continue to make efforts to improve its investment environment to facilitate smooth business operations, he said. It prioritised investment in electronics, garment and textile, agricultural machinery and supporting industries, production and processing of hi-tech agri and fisheries products, transport and tourism infrastructure, logistics, industrial parks, IT zones, urban areas, hospitals, and international schools, he added. According to its Department of Planning and Investment, the city attracted seven FDI projects last year with a total registered capital of $19.1 million. In seeking foreign investment, the city has focused on money instead of quality, and it plans to change this. The city has so far attracted FDI worth more than VNĐ20.08 trillion ($900.7 million), a quarter of all business investment. Most of the investors are from Asian economies like South Korea, Singapore, Hong Kong, Thailand, and Taiwan, with western countries like the US, Germany and France not having a major presence. Many of the projects were small in scale and use outdated technologies, and with little collaboration between large foreign firms and their domestic counterparts, the occurrence of technology transfer is rare. The city seeks to improve its investment promotion efforts to attract more quality foreign projects.